Info: This feature requires Content Station 10.16 or higher. Working on a publication within a Brand is a dynamic process: current or new issues need to be planned while published or outdated issues need to be made inactive. Managing publications this way is typically a task of a Brand manager. In Content Station 10, new issues can be created while existing issues can be modified and/or deactivated. 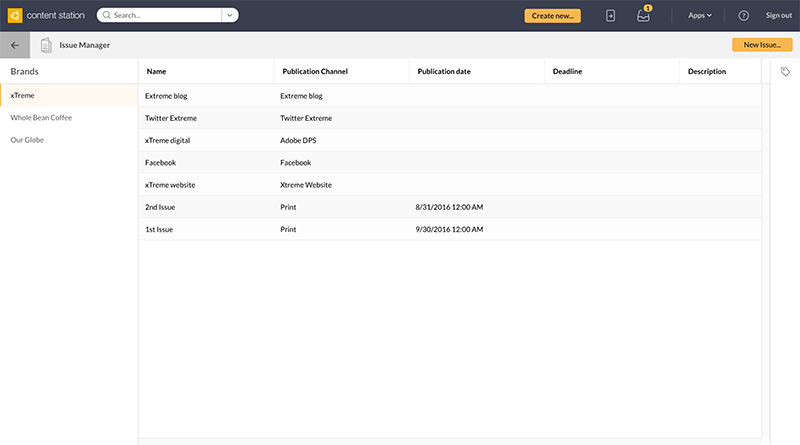 Managing Issues in Content Station 10 is done in the Issue Manager. From the Apps menu in the toolbar, choose Issue Manager. Figure: The Issue Manager Application is accessed through the Apps menu. You need to be assigned to a User group that is part of the Admin Authorizations of a Brand (with either limited or full admin rights). You need to have an Access Profile assigned in which the 'Planning' option is enabled (found under 'Applications', see Access Rights). Step 1. Click Create new... .
A window appears containing all the properties for that Brand. Which properties appear depends on the type of Publication Channel that is selected. Step 2. Fill out the relevant properties. Click Create & close to create the Issue and close the window. Click Create & continue to create the Issue and leave the window open to create another Issue. To modify an Issue, select it and change its properties in the Properties pane. Issues that have been deactivated do not appear in Content Station. To make these active again, use the Issue Maintenance page in Enterprise Server.